Business Angels – Are you out there? Do you know a business angel that is looking for a new adventure? 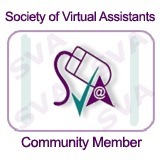 Why will hiring a virtual assistant will save me money? One of the most frequent things that I hear when out and about at my many networking events is that hiring a virtual assistant is just too expensive. A time and place to rest, relax and not have to worry about the deadlines or where you need to be. When working at setting up your own business it is challenging and you learn a lot. Self Employment conjures up a relaxed atmosphere, where you can spend quality time with your family, have a better work life balance. Is that true? Are you courageous enough to set up your own Business? Lots of people would like to set up their own business but worry about the financial implications or how will they get the clients; are you one of them?